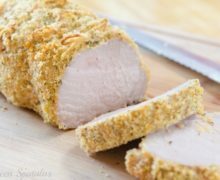 Lean Pork Loin is brined for juiciness and flavor, then covered in a rosemary bread crumb mixture, for a simple and delicious weeknight dinner. When I look around at the pork loin recipes I find in cookbooks or around the web, I’m always shocked to see that the majority of them don’t call for brining. I think to myself, am I brining for no reason? Can I skip that step altogether? Even when cooking these unbrined pork loins to the perfect temperature, they have always turned out dry! Dry, dry, dry! I just hate dry meat, don’t you? What gets me is that brining is so simple to do and it makes the pork significantly better, so why not give it an hour of brining? Sometimes it’s a pain to plan ahead, but it gives you a little safety net from overcooking and the meat is juicier, plumper, and nicely seasoned. 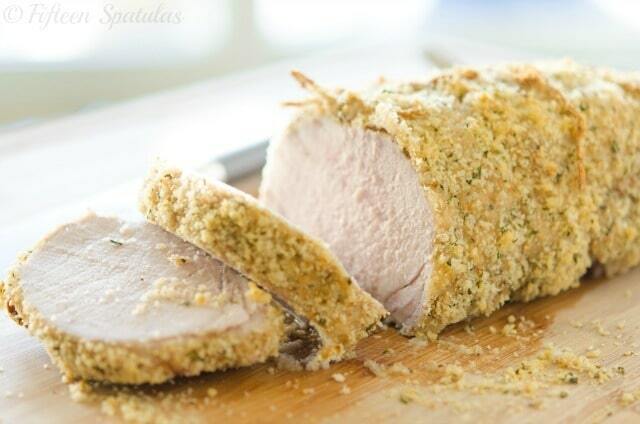 Pork loin is such a lean cut, and even with this rockin’ rosemary bread crumb topping, it needs a little brining help. 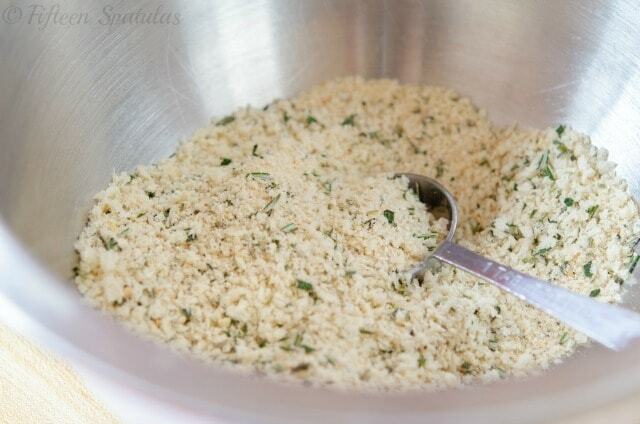 Mix the minced rosemary with a mixture of Panko and Italian bread crumbs, then add a little olive oil to moisten. 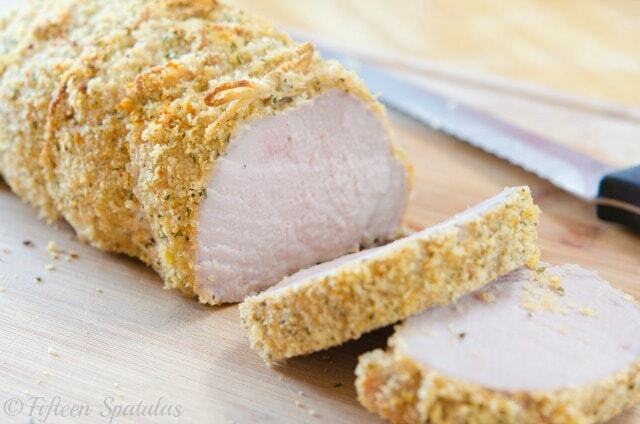 Now, do you see how the pork loin is naturally in a flatter, oval shape? If we let it cook like that, the pork loin will cook unevenly. So to avoid overcooking certain parts of the loin, tie it up nice and tight into a circular log to help it cook evenly. 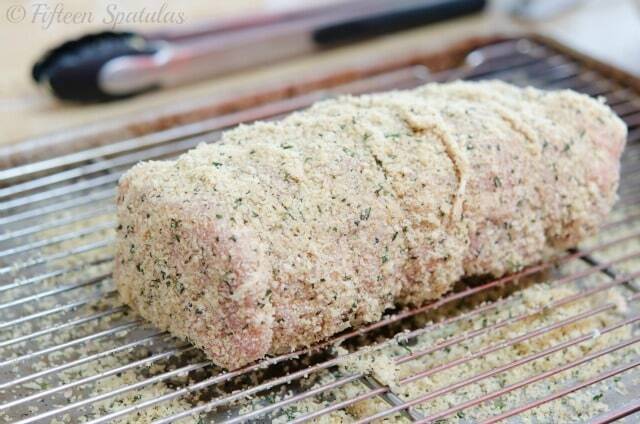 Brush the pork loin with Dijon mustard and roll the entire loin into the rosemary bread crumbs. Off to the oven! After about an hour, let the pork loin rest for at least 15 minutes so the pork can come to its final perfect temperature of 145 degrees F, and so the juices can redistribute throughout the meat. Bring 8 cups of water to a boil, then add 1/4 cup of salt. 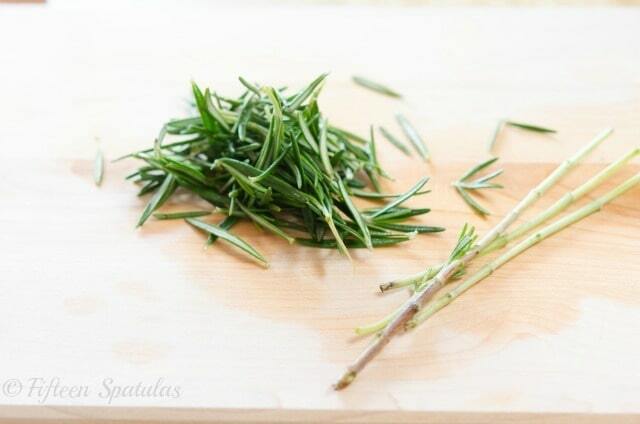 Stir to dissolve completely, then add the bay leaf and peppercorns. Remove the brine from the heat, and cool the brine down by transferring it to a bowl that can fit into another bowl filled with an ice bath. While the brine chills, you may trim any visible fat off the pork loin, if you wish. This is a matter of preference. Once the brine has chilled, add the pork loin to the brine and refrigerate for one hour. 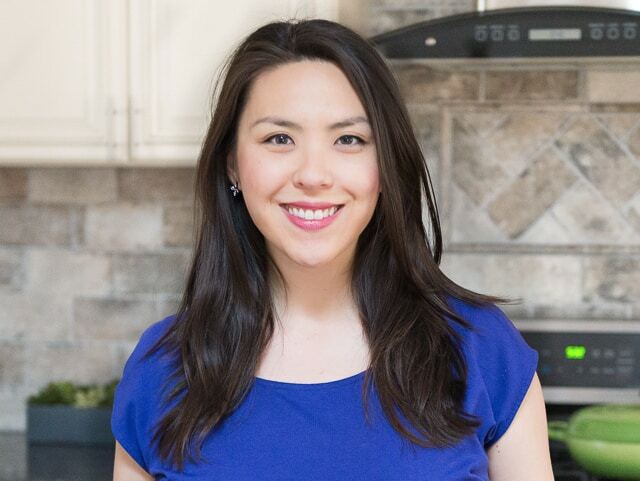 Preheat the oven to 375 degrees F, and set a wire rack in a rimmed baking sheet. 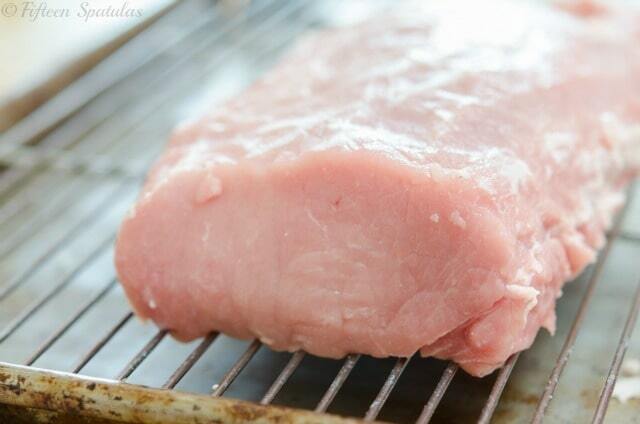 Remove the pork loin from the brine and discard the brining liquid. Dry the surface of the pork with a paper towel, then brush the entire surface with the dijon mustard. 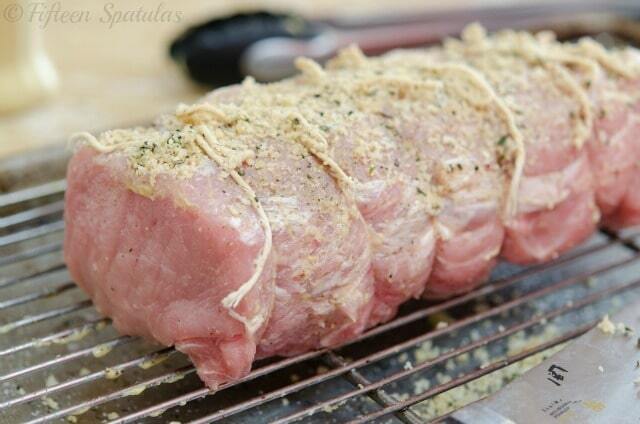 Use kitchen twine to pull together and tie the pork loin into as circular of a shape as possible. This will help the pork loin cook evenly (and also look nicer). 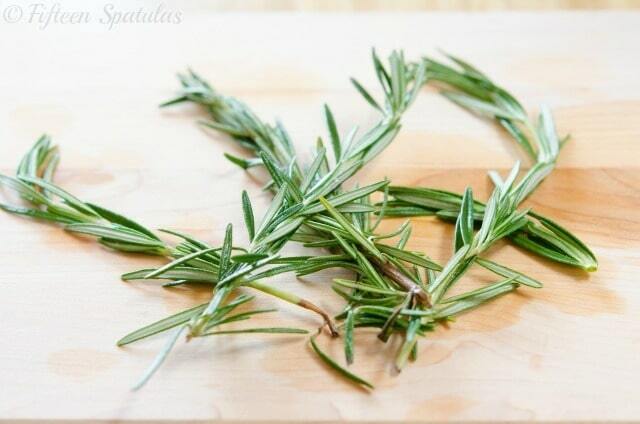 Stir to combine both bread crumbs, the rosemary, 1/4 tsp salt and 1/4 tsp pepper, and the olive oil. 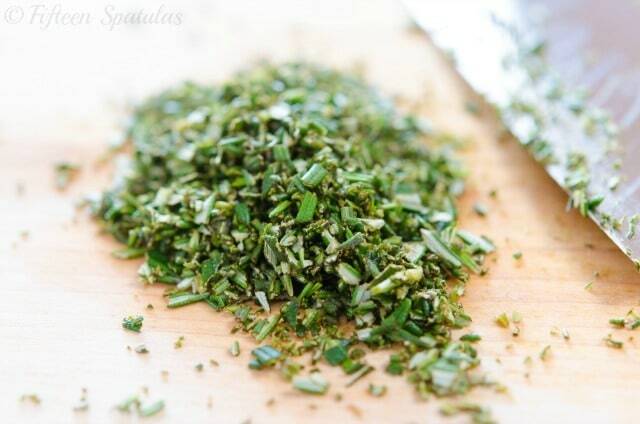 Press this mixture on the surface of the pork loin, all over the whole loin. Place the pork loin on top of the wire rack and roast for approximately an hour, but you want to cook the pork loin until a thermometer inserted through the side into the center of the roast reads 138 degrees F. Remove the pork loin from the oven and let it rest for 15 minutes (you may tent it with foil to keep it warm). The resting stage is very important because the residual heat in the pork will further cook it to approximately 145 degrees F, and the juices will be allowed to redistribute. Slice the pork when ready to serve, and enjoy! I see some brining in my future. This is just lovely Joanne. Can’t wait to try this one. This looks delicious! Would love to make this for a crowd – it’s so pretty, and I’ll bet it tastes delicious!